Endodontics (Root Canal Treatments) is one of the 13 official dental specialties recognised by the General Dental Council, the UK dental profession's regulatory body (a list of these specialties and accredited specialists can be found on the GDC Website). Endodontics focuses on the management of conditions affecting the pulp of the tooth. The pulp sits inside the tooth and consists of a bundle of nerves and blood vessels. It can be damaged in different ways including decay, trauma, cracks, etc. If the pulp becomes damaged beyond repair, the infection can spread throughout the root canal system of the tooth. This can eventually lead to an abscess forming and causing severe pain and swelling and the tooth may have to be extracted rather than preserved with a root canal treatment. Endodontic Treatment or Root Canal Treatment involves removing the damaged or dead pulp and disinfecting the space that is left behind. The space is then filled with a material that seals the tooth to prevent bacteria returning to the area. The tooth can then be filled but a crown is often advised to provide extra strength and support to the root-treated tooth. At Naidu & Naidu, we are proud to have Sheetal looking after this aspect of dentistry. She is currently undertaking the Specialist Training Programme in Endodontics at Guys, Kings and St Thomas' Hospital and will be able to help you throughout the treatment. Sheetal will look after you in a calm and relaxed way and you can be certain that the treatment will be undertaken using the latest techniques, materials and equipment including the use of a high-powered operating microscope. 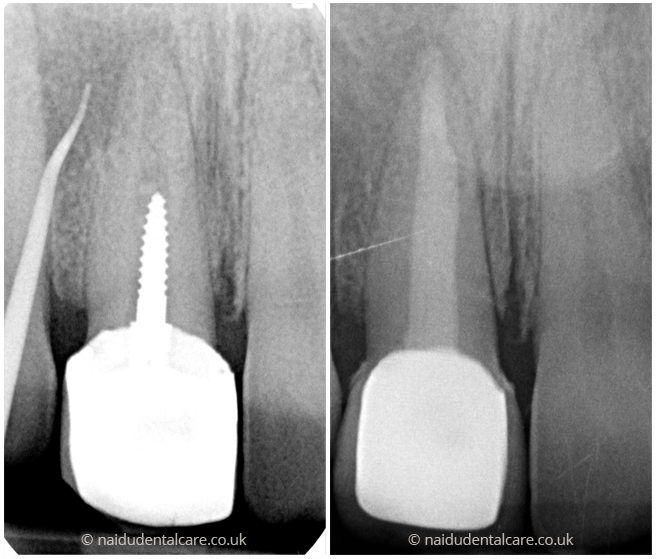 This case involved removal of a screw post followed by placement of a MTA plug and fiber post and construction of a new porcelain bonded crown. This case involved root canal retreatment of the upper second premolar and provisional placement of a composite core. Root canal retreatment of the lower right first molar was carried out followed by a provisional placement of a composite core.